Looking for a healthier zucchini bread? Look no further. Most people tend to believe that zucchini bread is healthy as it has vegetables in it. Well, it does have vegetables in it but it also has a lot of sugar and butter in it and not really that much zucchini in it. Sure it is a delicious way to use up some of that zucchini that your garden is overgrowing. You know you have way too much zucchini when your neighbors don't answer the door when they see you coming. I don't have a green thumb so I love when my neighbors bring me garden goodies. Can I just make a suggestion? Please pick the zucchini before it gets the size of a small baseball bat. Bigger is not better when it comes to zucchini as the bigger ones tend to be tough. The ones that taste the best are less than a foot, like the ones you can buy at the store. When your kid asks for veggies, it is always a good thing! My boys have been asking for zucchini bread and my neighbors have not brought me any. So I bought some zucchini at the store, I love eating Easy Baked Parmesan & Tomato Zucchini Gratin year round. When I make treats for my boys, I like to make them healthier so I will make it with less sugar and fat. I also add a bit more zucchini or some fruit like blueberries or pineapple. Sometimes I will add oatmeal for added nutrition but for this recipe, I choose not to add the oatmeal as I did not want that texture. The lemon juice brings out the sweet taste of the blueberries. 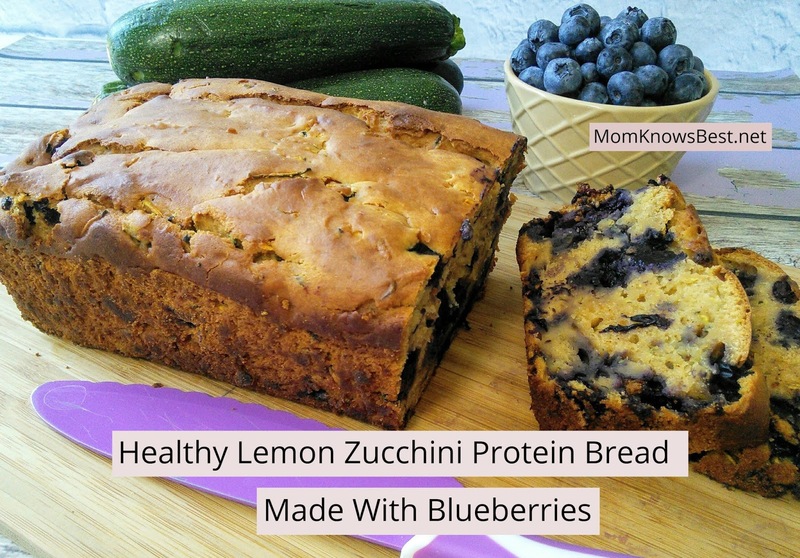 You will love this low-fat & low-sugar protein zucchini bread! If I am able to make a recipe with less fat and sugar without compromising on taste I will. 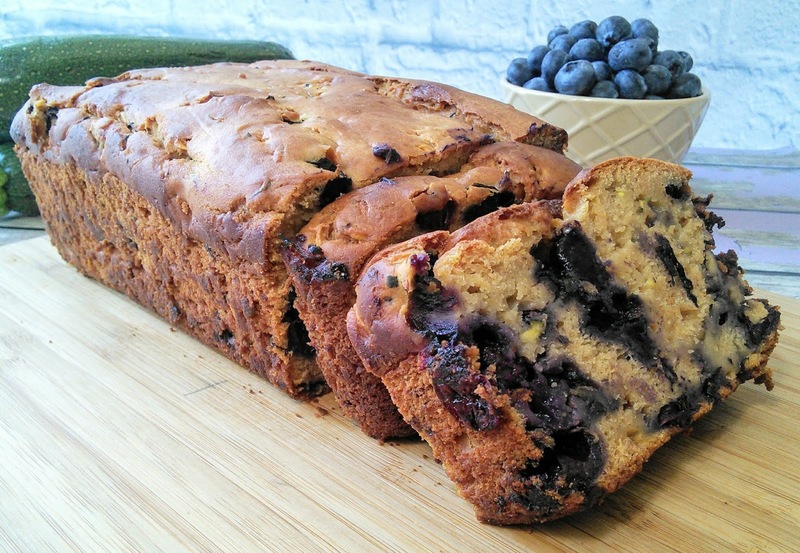 The lemon and blueberries add so much flavor to this bread. That way I can indulge in a treat with no guilt. 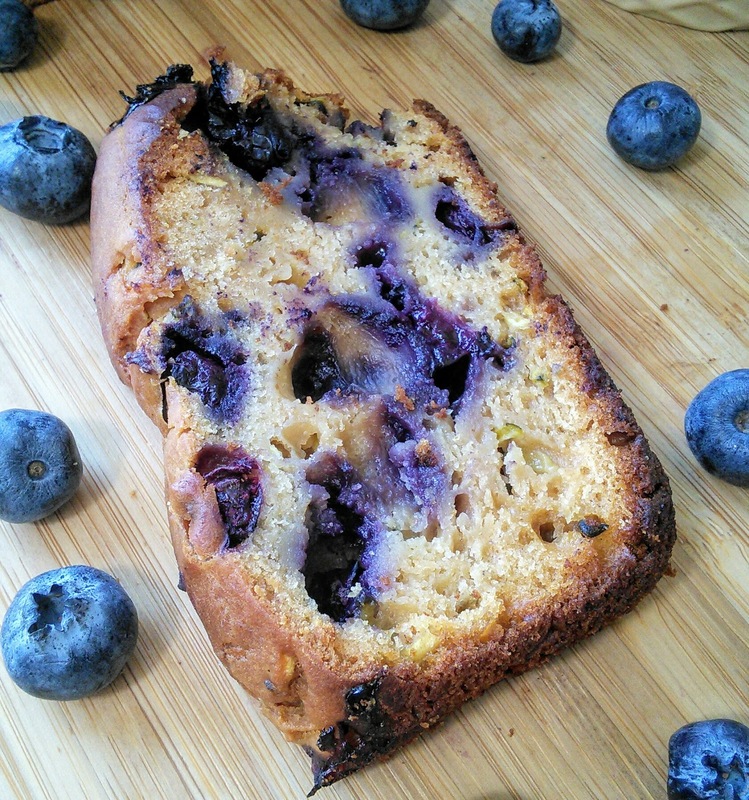 This zucchini bread has veggies and fruit in it so it is a healthy no-guilt treat that I can enjoy with my morning coffee. 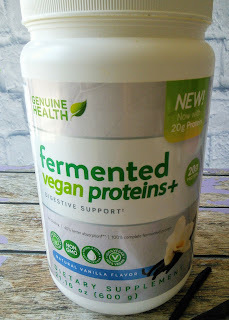 When I add vegan protein powder to it, then I can enjoy it for breakfast. The protein powder also makes this bread incredibly moist. The best part of this bread is you can't see or taste the zucchini. The blueberries cover up the zucchini but not the added nutrition. Lightly coat a 9 by 5-inch loaf pan with oil. 1. Combine the flour, baking powder, baking soda, and protein powder, set aside. 2. Beat the egg, honey, and oil with a whisk or mixer. Add the yogurt and lemon juice and mix well. 3. Then add the flour mixture and zucchini, combine this by hand. 4. Fold the blueberries into the mixture. 5. Pour the batter into the prepared pan. Bake for 40-60 minutes or until an inserted toothpick comes out clean. 6. Cool the bread for about 30 minutes. To remove the bread from the pan, take a butter knife around the edge of the bread and then place a plate on top of the bread. Turn the pan over and lightly tap. The bread should come out of the pan. That looks so moist and delicious. I think I need to pin this to my recipe box. Yes please! I would LOVE the blueberries in this. I'm a huge blueberry fan. I'll have to try and make this. A great way to use all that zucchini we've been picking! OMG this looks so delicious! I love zucchini bread so much! It's one of my favorites. This lemon zucchini bread looks delicious! I also love that it is healthy! I so have to make this at home very soon. Oh yumm! I could have some right away with tea. I'll definitely come back to this recipe. This looks absolutely delicious!!! I definitely want to try this healthy, yummy snack. Thank you!!! You can give me blueberry anything and I'll say yes! Even better when it's healthy. I'll have to try this out. 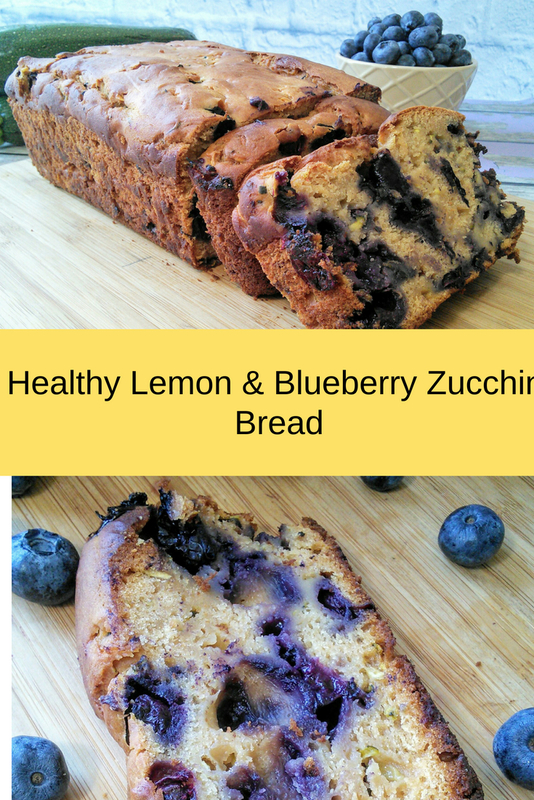 I am such a huge fan of zucchini bread and lemon blueberry muffins. You have taken the best of both worlds and turned them into a healthier powerhouse of a bread. Bravo!!! What a wonderful combination! I will try it out this weekend! I love bread so much even though it's usually with no so much yummies. I believe that this lemon zucchini protein bread is not only so healthy but also so delicious especially with the blueberries. Anything with lemon or blueberry entices my taste buds. I would love to try this recipe. Thanks for sharing! This was a great read. Thanks for this! Looks so tasty. Now that's an interesting recipe, I'd love to make this one someday. That looks absolutely tasty and it even has blueberries, YUM! Looks yummy. Been looking for something nice and different to serve, and this is perfect. Thanks. This looks yummy! This is such a wonderful combination. I will try it out this weekend! Two of my most favorite ingredients !!! What a healthy and yummy combination. Would definitely try this out! I love baking so much and baking something healthy sounds even better! love the sound and look of that bread! This looks like one healthy and yummy bread! I'm not good at baking but I love a good, fresh and tasty bread. Yum! This is delicious and awesome. Lovely zucchini. Fresh and sweet.